Didn’t go to Gilbert. Just went to War. Still, it was a 130-mile trip. Woke up to 20 degree weather, but it was clear. We were supposed to meet at Rider’s Paradise for breakfast at 7:30am. By 8:30am Coop and his friend JD had not shown. While eating breakfast with Doc B and his grandson, Eli, I noticed I didn’t have my own tracks to War. So I ran up to my camper at Hilltop, downloaded the tracks to my GPS and went back to Rider’s Paradise. Coop and JD were there. They had to get chainsaws out to cut a downed tree off the trail. We headed out around 9:00am. Rode to Walmart and from there to Gary, and then to War. Ate at a relatively new and nice restaurant called Coalfield café. Ordered a club sub and a coke. When it arrived, I realized I couldn’t eat it all, so I halved it with Doc Best. While we were in the café we asked how to get to High Rock Overlook. We were told it was too dangerous to go up there now. We tried anyway and we made it. Spectacular view. This is me on the ledge. Coop wouldn’t get on the ledge for me to take a picture. After High Rock Overlook, we went down a trail that would have been impossible to go back up. The ruts were deep. We literally slid on our skid plates most of the way down. We gambled we could get to the bottom. Had we come up on a washout, we would have had to walk out. Luckily, we made it to a road. Got gas in War and went back to Hilltop. Most of the trails were on Bob’s map. A few were not. JD did most of the leading. Coop some as well. I’m impressed that Coop could guide us by memory alone. He’d forgotten to bring his GPS tablet. I lead for a little bit. Got back at 8:00pm. Was totally wore out. Ate a late dinner and hit the sack. Slept well. Sunday morning, Lonnie, Doc B. and Steve H road. Steve rode shotgun with me. I think he was sore from riding his quad the day before. Ate breakfast at Wrong Turn. Rode the outside loop of Pocahontas. The ½ day was pleasant. Would have to debate it since the folks at the Coffee Shop are so hospitable. I always like that rock overlook. Neat place. Glad y’all didn’t try Gilbert. That would have been 160 or more really long miles. We rode to Berwind State Park hoping we could ride around the lake. Just as we got to the entrance, we saw a sign that said "ATVs Prohibited". We were bumbed out. So we turned around. On the bright side, we found a back way up to High Rock Overlook. We had great riding SatAnd Sun. I think we saw every kind of terrain and trail in one day. Nice write up Larry, thanks for sharing. Sounds like you all had a good ride! How was the trail up to High Rock. It was very bad a year ago and a local dozed it. I took it off my public map since it can't handle a lot of traffic. Bob - The trail was a bit steep and challenging, but well groomed. 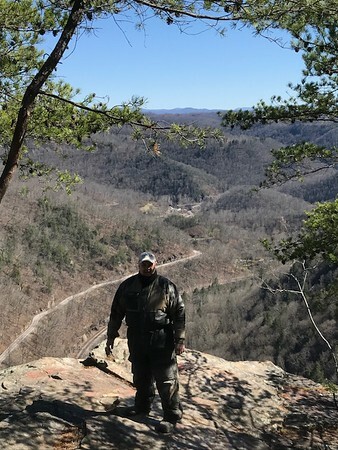 Coming back from Berwind Lake, heading North, we notice a trail that looked like it might take us close High Rock Overlook. Again we were south of the Overlook. Sure enough it got us there. We went way wrong going back down a different way though. We got lucky. I'll send you a track. FYI there's a trail coming down off that mountain in every direction.. last time I was with Randy out that way, Randy's pupu broke down in that farmers driveway where you guys came down off of that mountain. the farmer is a really nice guy and offered to help us out and told us the story about that trail. My group tried that trail up the mountain by the farmers property about a year ago. Talked with him to find the entrance, nice fellow. Once about half up, we could not get traction from a dead stop to continue up and had to back down. It was steep and washed out bad then, sure its terrible now. Larry you gotta put 2 tires on one side of the bank and ride the wall man... Lol us atvr's don't mind that trail at all..